The 7711/21 Rev C Advanced Rework/Repair Certification Kit is ideal for rework/repair training or to evaluate rework skills. Includes 1 fully populated board with staking and conformal coating, and TH/SMT replacement components. Tin/Lead. The 7711/21 Rev C Advanced Rework/Repair Certification Kit is ideal for rework/repair training or to evaluate rework skills. Includes 1 fully populated board with staking and conformal coating, and TH/SMT replacement components. Lead-Free. The PC-A620-Parts Kit includes all parts needed to train and practice wire and cable harness building skills. Meets IPC/WHMA-A-620 Hands-On Module requirements. The PCB-A620 is a wooden fixture with diagram and metal pins to make wire harness building easier. Made for the PC-A620-Parts Kit. The PC-A620 Space-Parts kit includes all parts needed to train and certify a student in the IPC/WHMA-A-620 Space Addendum. Meets IPC/WHMA-A-620 Space Addendum Module requirements. The PC003 SMT hand solder practice kit is a low cost, effective kit for training and testing employees. Includes a PCB and SMT components. The PC003 LEAD FREE SMT hand solder practice kit is a low cost, effective kit for training and testing employees. Includes a PCB and SMT components. The PC009 Mixed Technology Kit has both surface mount components and through-hole components. The primary use for this kit is hand soldering training. 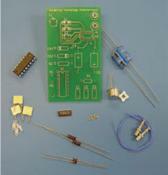 The PC009 LEAD FREE Mixed Technology Kit has both SMT components and TH components. The primary use for this kit is hand soldering training. The PC013 Through-Hole and Terminals Hand Solder Practice Kit is an effective way to evaluate or train employees and students. The PC013 LEAD FREE Through-Hole and Terminals Hand Solder Practice Kit is an effective way to evaluate or train employees and students. Designed for J-STD-001 training, the PC016 LEAD FREE Mixed Technology Kit is an effective and economical way to train and evaluate hand soldering skills. The CircuitMedic 201-4350 is a repair skills practice kit that includes a Circuit Board with Defects, Frames and Tracks to Repair. The WTK-1 Kit includes everything needed to train and practice wire soldering skills. Includes wire, terminals and terminal holder. The WTK-1-WO Kit includes everything needed to train and practice wire soldering skills. Includes wire and terminals. Does not include terminal holder. The TB01 is a heat-resistant terminal holder for use during soldering.